Please note that this post is for my own educational purpose. Most algorithms are related to Deep learning → and many of the bias of human beings will carry over. 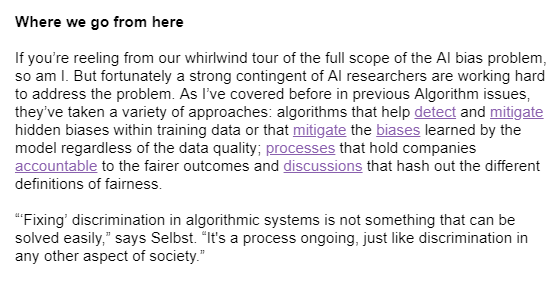 Bias → can happen in any stages of AI process → this is a very important question to tackle and create solutions. → fairness is a key question to answer. The Data → itself can contain more bias data → such as light skin faces vs dark skin faces → or → amazon → remove females. 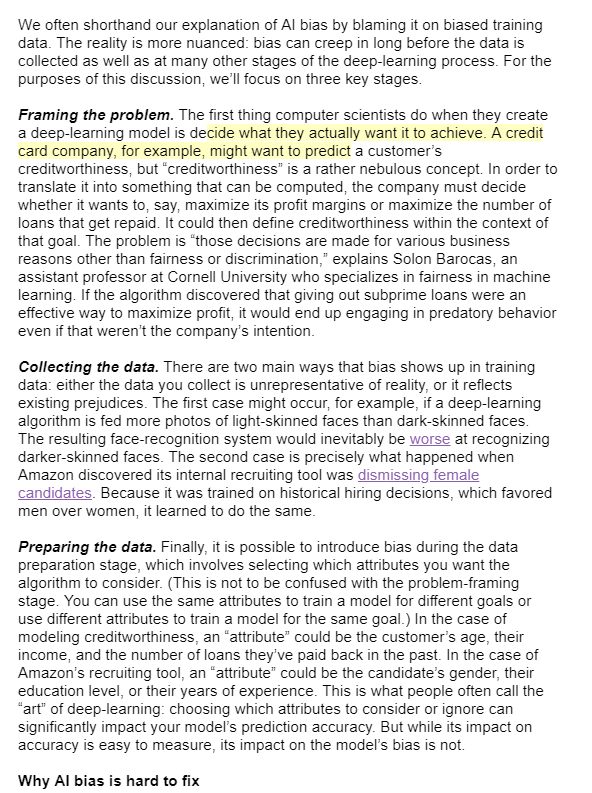 Preparing the data → feature engineering can also play a role in the creation of bias. This is a key is to tackle as well. Which feature does AI choose → a hard question to answer. Why is this hard to fix? We might not even know that bias exists → we might not even know that a problem exists. Not a lot of pre-trained model → does not care about the bias values → and this pre-trained model can carry over. People who create ML → does not care about the social problems → just implement and beat the benchmark. (different social aspects have to come into play.). We are addressing this problem as well → detect and fight back the bias process is critical. 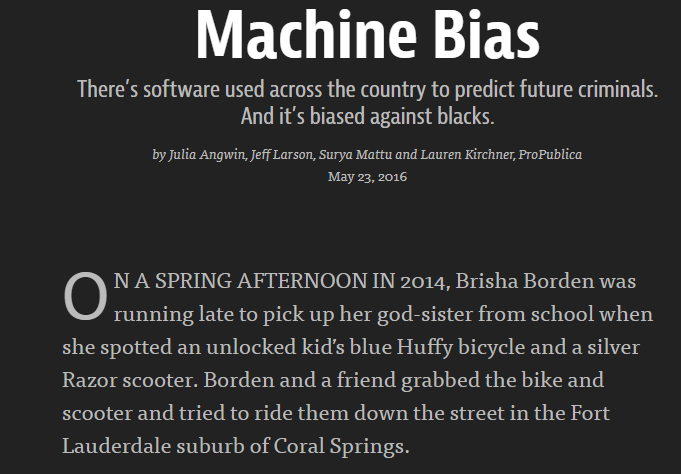 An algorithm is a bias against towards black people → this is actually used in the court system. A race is not used → so is this fair? Since we do not care about the race → this seems pretty fair? Black people are more likely to get a high score. (since some metadata does contribute). However, there is some limit on how much an algorithm can be less bias. Some other solutions do exist → but this is not an algorithm solution. Some girls went into trouble and charged with theft. So many people have done shady things and software → thought black people would again do criminal activity. In this case, → the white person made another crime. 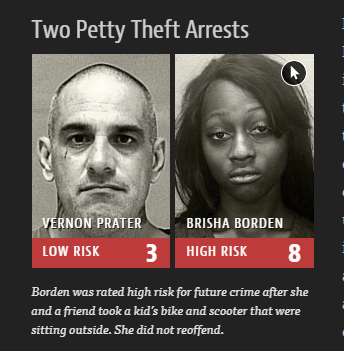 The guy on the left is in jail, and a risk score → might be a bias in the software. So the algorithm thinks black people are more likely to do a crime. The company did not open-source the used algorithm, hence we cannot know what the algorithm is doing exactly. This is a problem → since more and more judges are using this system. Some people do need to go to jail → but they get a low score, while other people get a higher score. 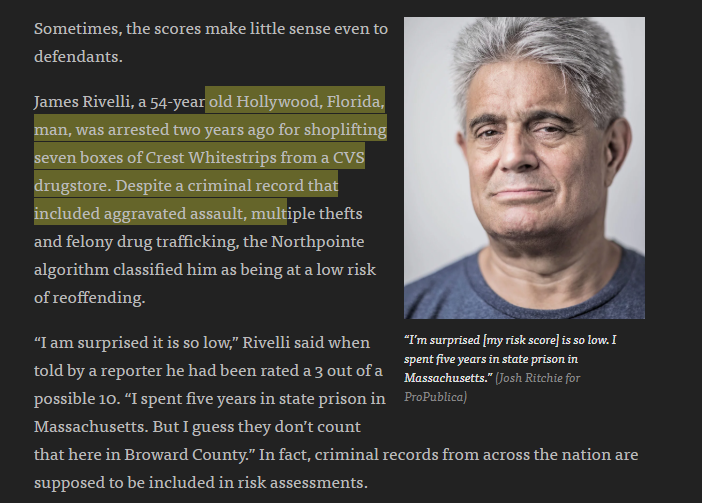 He had a lot of criminal charges → but had a low score from the software. This is a social problem that needs to be solved for the children of the next generation.